Every year for my birthday, I will have a dress that I will save to wear for the first time on my special day. I have been doing this from since I was a child and my mom would take me clothing shopping for the new season just before my birthday. 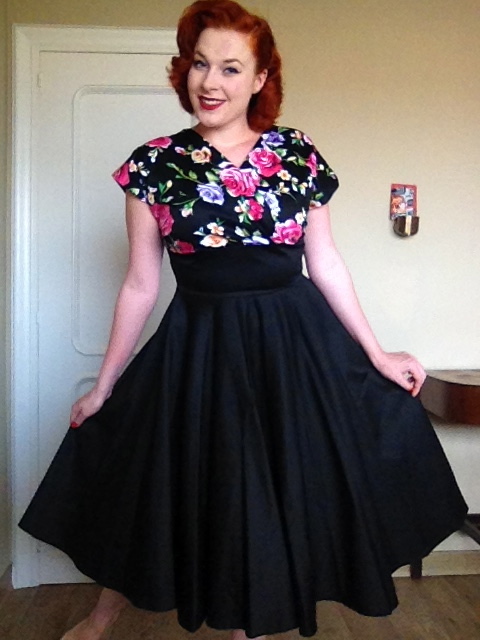 If you have been following my blog for a while now, you know I absolutely LOVE Vivien of Holloway. I have several dresses from Viviens hand and they are all little masterpieces. But my Vivien of Holloway collection consists mainly of summer dresses, and this time I wanted to go for something I can wear during most of the year. And of course I managed to find a great addition to my closet. I already own a GORGEOUS Grace Wrap Dress *click for the review*, but since that dress is quite the statement, I wear it for special occasions. I absolutely love the cut of this dress, and I knew I wanted to get the same style for a more everyday dress. 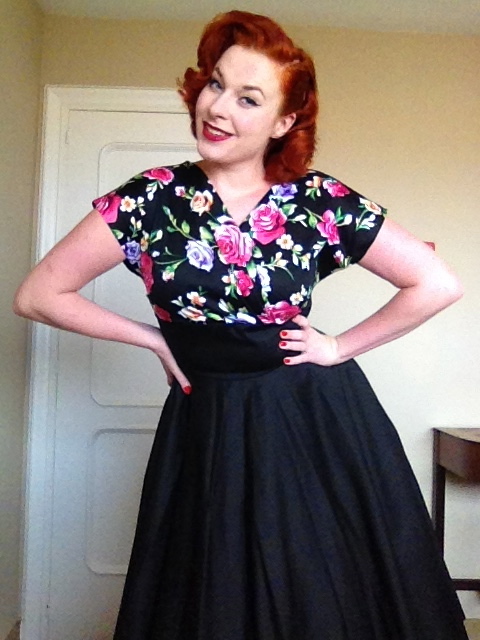 So I chose the Grace Floral Noir dress. The absolute best feature of the Grace dresses is that they have a beautiful neckline, modest and elegant. Next to that they have a great length, (TALL GIRL FRIENDLY!!) a full circle skirt and they come in beautiful prints. 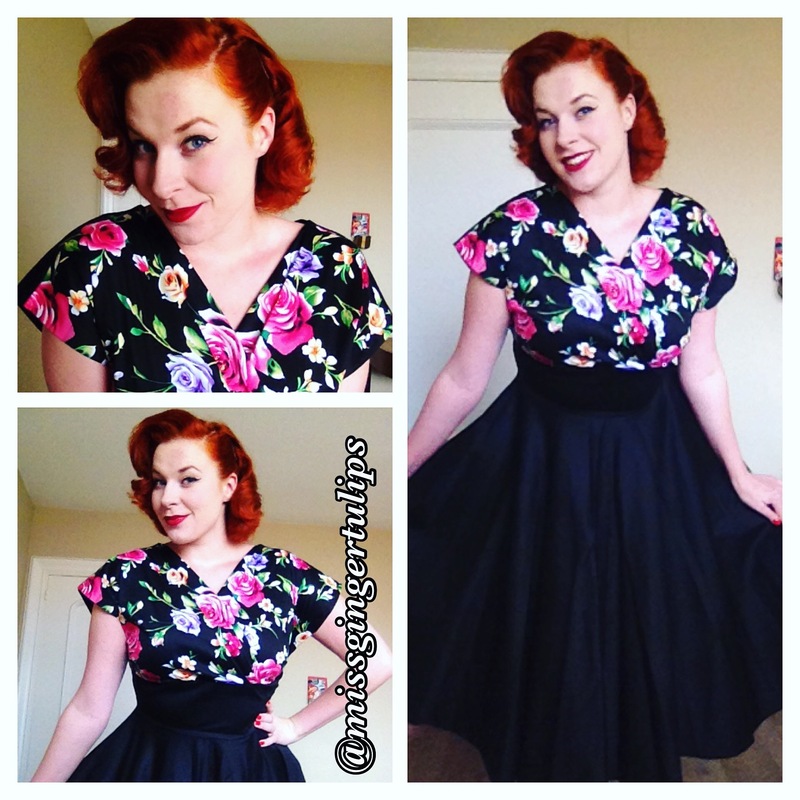 This particular dress has a gorgeous floral print over the bust, wrapped around, making a beautiful contrast with the waistline that goes into a amazingly full circle skirt. 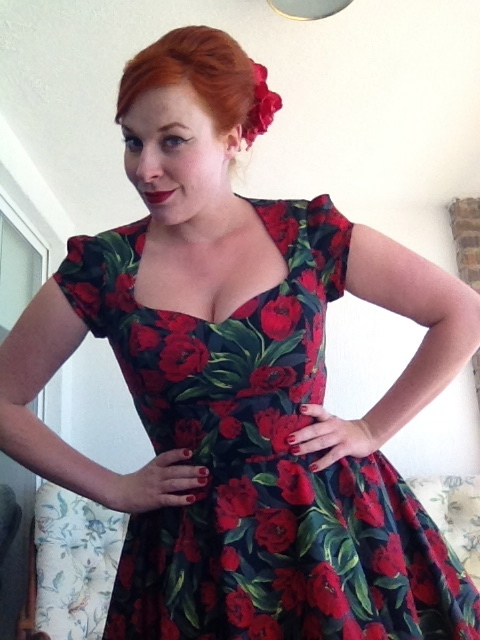 As every single one of my Vivien of Holloway dresses, the quality of the fabric is amazing. The colours of the floral print are vibrant, and the pitch-black fabric has a beautiful sheen to it. The sleeves of the dress are an example of typical 50’s modesty, covering your shoulders and just a bit of your upper arm. I wore this dress out to a dinner for my birthday and it made me feel like a true princess. I have gotten so many compliments wearing this dress! 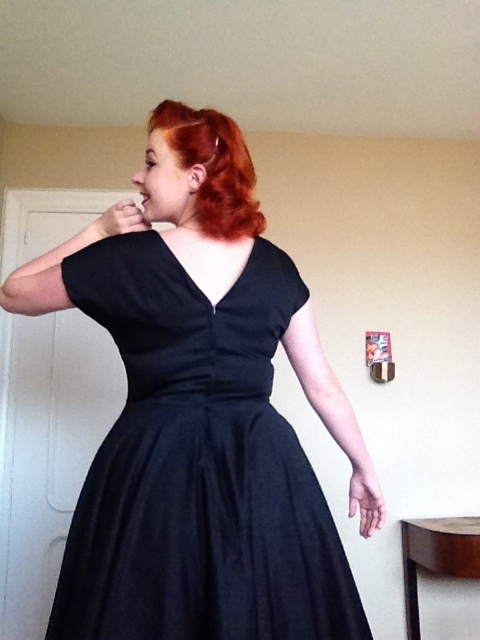 The back of the dress is all black and falls in a beautiful v-shape showing some skin whilst being very modest. The dress is extremely comfortable, elegant and is sure to turn some heads. I get a lot of questions about what I wear in winter. Well, dresses obviously. I pair them up with thick stockings or tights and cardigans to make sure I keep nice and warm, I would do the same with this dress of course. 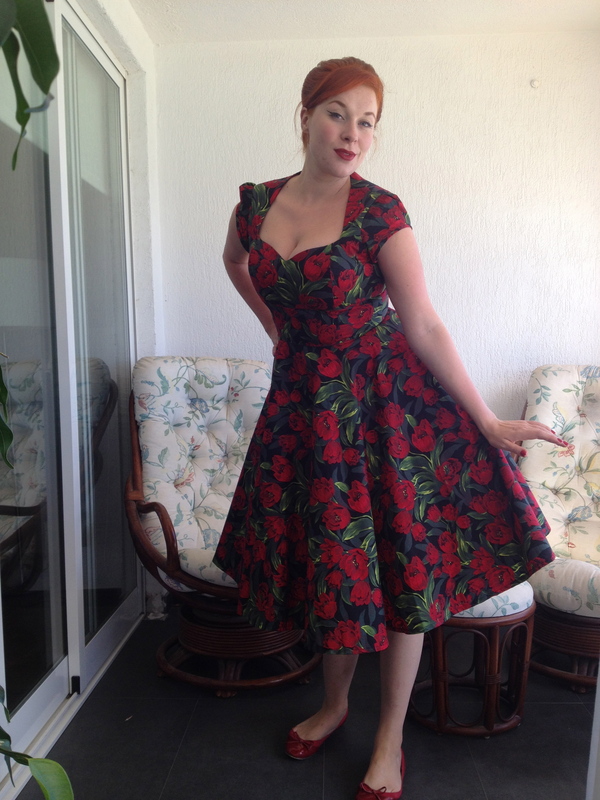 Something that had been on my wish list for a long time but I never really got to buying was a 40s or 50s inspired dress with a Tulip print. Because how can somebody named Miss Ginger Tulips possibly go without one? Then there was a lazy evening watching dressporn on Etsy, and there I found Louise Rose Couture‘s shop carrying a beautiful white tulip print dress. It stole my heart, I fell in love. Hard. The only problem was that the dress she had ready was a size too big. So I decided to send Louise a message to ask her if she could take the dress in a size. Talking to her, I immediately noticed that the owner, Louise Butland, is such a lovely lady, with lots of experience and know-how. Taking in the dress came with having to take the whole dress apart, so Louise took the effort to ask her supplier for more fabric so she could make the dress from scratch with my exact measurements. The supplier didn’t carry the exact same fabric anymore, but did have the same one with a black background, and it made me fall in love even more. 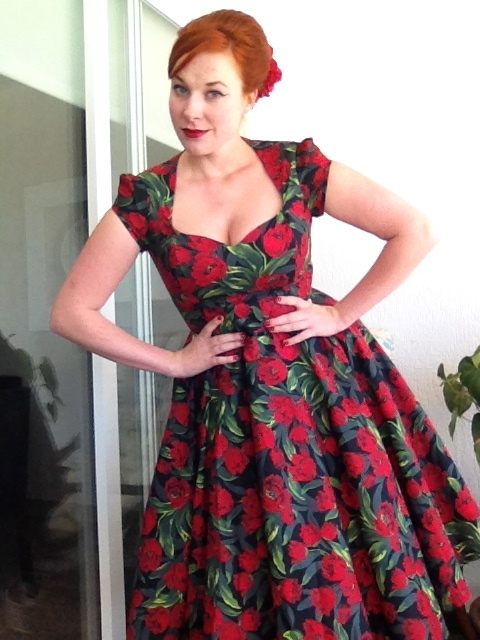 So I gave Louise the go ahead and she started making my dream dress. Louise makes the most beautiful designs from her studio in the UK, taking inspiration from vintage glamour, particularly focusing on the 1940s and 1950s. All her patterns and dresses are handmade in her studio and her creations are all limited edition and seasonal, meaning each design is only made a handful of times. What I love is that Louise produces in a wide size range, from size 6-24. Next to this, Louise offers a costume, bespoke and bridal service. So let’s talk about this dream of a dress! Within two weeks it arrived! So quick! 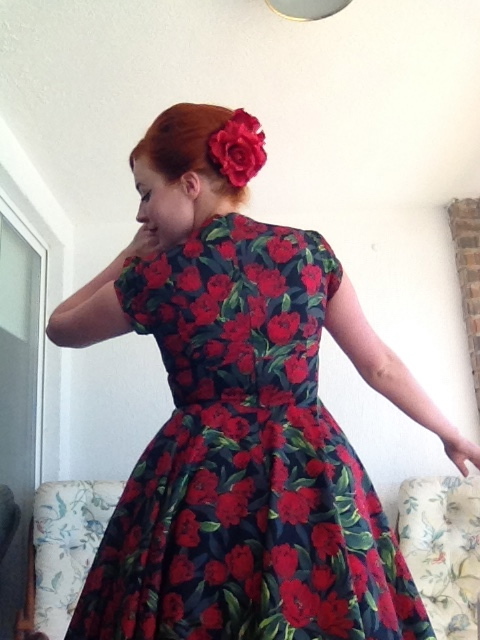 You know it’s a good dress that came in when you do a little happy dance when you open the parcel. This was exactly the case. 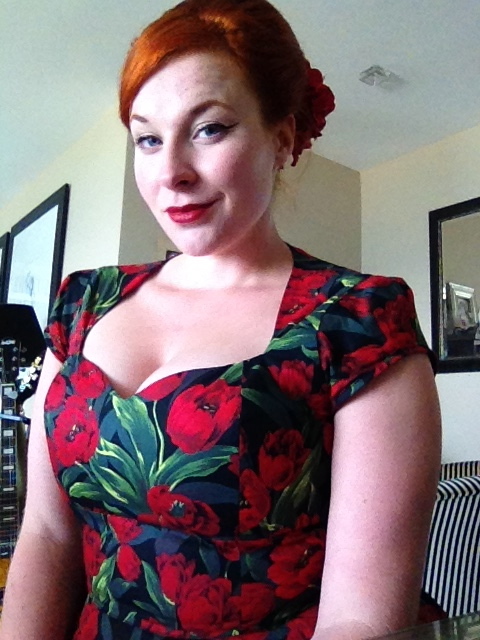 The tulip print is so cute and vibrant, and the fabric is of a beautiful quality. But the best part came when I went and put the dress on. Because it fits like a glove. It was in every possible way made for me. 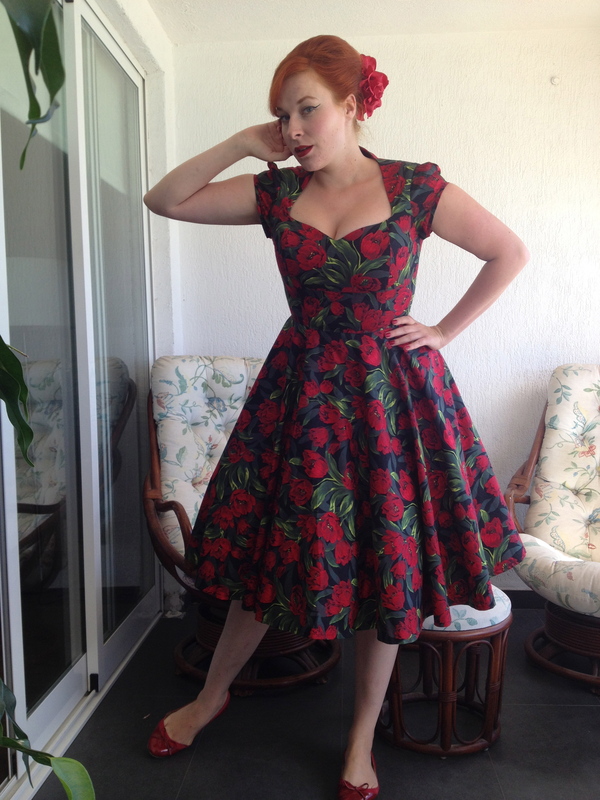 Of course Louise had my measurements, but still, the pattern of the dress seems like it was designed exactly for my body shape, with lots of room for the boobies, fitting nice and snug around the waist, fitting perfectly around the shoulders and with cute cap sleeves and a gorgeous neckline. ❤ It’s so flattering, it makes me feel like a million bucks! I am a big lover of dresses you can wear all year round. This dress is perfect for summer as is, and in winter it can be combined with tights and a cardigan. So needless to say, I am extremely happy with this little piece of art. You can really notice that there has been put a lot of time and effort in this dress, the quality is so high and the fit is perfect! This dress with this particular print is still up for sale, next to that you will find a lot of other amazing designs! Go check out Louises Etsy shop or her website http://www.louiserosecouture.com.